Fish in Comfort with the Extra-Wide 11 Feet Saturn Inflatable Fishing Boat. 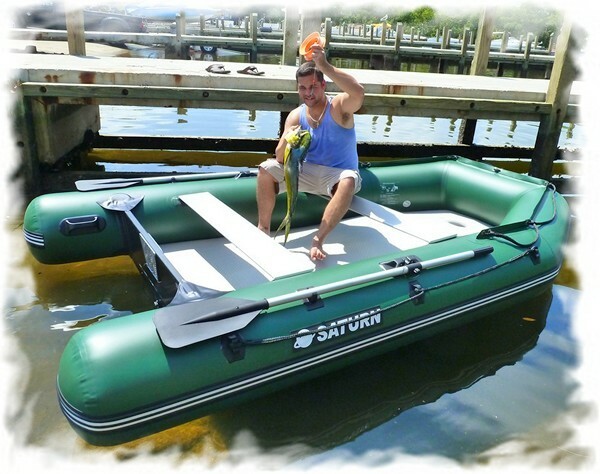 HomeBoatsToGo - Blog About Inflatable Boats, Inflatable Rafts, Inflatable Kayaks And More...Fish in Comfort with the Extra-Wide 11 Feet Saturn Inflatable Fishing Boat. Is there anything more relaxing then a day out fishing? To me, the answer is a resounding "no". I just love floating around, casting a line, and waiting for the bite. That's why when I chose my latest fishing boat, comfort was one of the main factors that went into my final decision. After taking a careful look at all of my options, I ended up purchasing an Extra-Wide 11' Saturn Inflatable Fishing Boat. And what a great decision it was! 1. Comfort. As I said earlier, I like to be comfortable when I’m out for a relaxing day of fishing. I bet you feel the same way. And the Extra-Wide Saturn Inflatable Fishing Boat has features that provide just what I was looking for. For one, the body shape was uniquely designed specifically to give passengers more room for themselves and their gear. At 79” wide, the interior of this boat is significantly more spacious then other boats in its class. Believe it or not, the passenger space of this 11’ long boat is big enough to support multiple beach chairs or a lounger. You can even bring a little table and chairs along for the day! 2. Convenience. In general, inflatable boats are significantly more convenient than similar sized solid hull boats, and the Extra-Wide Saturn Inflatable is no different. For starters, inflatable boats like this one can be quickly deflated and easily stored anywhere, taking up very little space. This is also a major benefit when you want to bring your boat with you when you travel, since there will be no need to tow it with a trailer. And with the easy-to-use pump, the boat can be quickly re-inflated on site and put right into the water! 3. Performance. Despite being wider than most other 11’ boats, the Extra-Wide Saturn Inflatable can still perform at a high level. The round end tubes have been designed specifically to increase performance, which has helped my boat plane evenly even as I use it with the maximum-suggested 15 HP motor. Add that to the rigid, heavy-duty hull, and this boat performs at a way higher level then you ever dreamed! 4. Durability. When I mentioned to my friends that I bought this inflatable boat, almost all of them had the exact same first question. “Won’t that thing pop?” This is obviously something I researched extensively before deciding on an inflatable boat, and I found out something interesting. Inflatable boats, when made correctly, are incredibly durable! For instance, the Extra-Wide Saturn Inflatable is constructed out of 1100 Denier Reinforced PVC, which makes it almost impossible to puncture. Add that to the separate internal air chambers, and this boat is both extremely versatile and incredibly safe. 5. Cost. Despite all the previous great things I just told you about this boat, cost might actually be its greatest asset. Compared to its hard-hull counterparts, the Extra-Wide 11’ Saturn Inflatable Fishing Boat is extremely cheap. But purchase cost isn’t the only way you are going to save significant dollars. Don’t forget that you don’t need to pay for docking your boat if you go with an inflatable. Add that to the fact that you don’t need a trailer to tow your boat (and a truck to tow the trailer), and the savings continue to add up without you even having to sacrifice performance. That’s why for me, choosing this boat was a no-brainer!